Campbell USD ​​​NGSS Resources - What is NGSS? Click here for an annotated example. 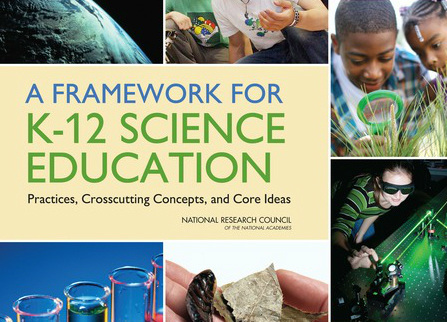 Click here to download a free copy of the entire NGSS Framework. Click on the buttons below to go directly to the videos. Spring 2016 - Science CSTs, CMAs, and CAPA administered in grades 5, 8, and 10. 2016-2018: NGSS Transition Phase – build foundational resources, implementing needs assessments, establishing new professional learning opportunities, and expand collaborations between all stakeholders. May 19 - 20, 2016 - IQC analyzes results of public review, revises draft, and approves second draft of Science Curriculum Framework for public review. June – July, 2016 - Second 60-day public review period of Science Curriculum Framework. September/November 2016 - SBE to take action on the proposed Science Curriculum Framework. - Action could be delayed to as long as January 2017 if needed. 2017 and beyond: NGSS Implementation Phase – expand professional learning support, fully align curriculum, instruction, and assessments, and effectively integrate these across the field. 2016-2017 Anticipated Pilot Testing Year for NGSS Assessments. May, 2017 - 5th, 8th, and 10th graders take existing CST/CMA/CAPA science test. 2017 – 2018 Anticipated Field Testing Year for NGSS Assessments. November 2018* - PROPOSED: Instructional materials adoption list available by SBE.